There’s all sorts of things to like about winter: mulled wine, Christmas, snow-bound scenery. But what people don’t love is the icy roads and surfaces that winter so often brings – especially since it can prove such a hazard in the workplace. Luckily, here at Excelsior, we use our rotomoulding process to create plastic grit bins that are built to deal with just that sort of problem, acting as handy storage for grit (otherwise known as rock salt) to melt the ice. But how exactly does this gritting process work? As we touched upon above, another name for grit is ‘rock salt’. There’s an excellent reason for this. It is indeed the very same stuff you get in your salt shakers on your dining table at home (it’s just a little chunkier – the stuff on the roads hasn’t been ground down quite as finely). The rock salt’s main job is to dissolve into the liquid water on the ground, melting the ice and lowering its freezing point in one fell swoop, temporarily preventing ice and frost from forming on the ground again so it’s not nearly as dangerous to walk or drive upon. Why Choose Our Plastic Grit Bins? We manufacture our own plastic grit bins using our roto-moulding process, and many of our customers find that just one of them is sufficient to serve their business premises throughout the winter. 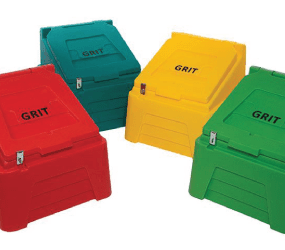 Though grit bins in years past have been made from more unyielding material – such as wood or even concrete – in recent years these have been phased out due to safety concerns. A car colliding with a concrete grit bin, for example, may well lead to more serious damage or injury than if it were plastic. At Excelsior, we’d advise you not to take the risk. Having your own grit bin means you don’t have to endure that nagging feeling of worry when you wake up to see icy roads, and ensures that you’re able to protect both your own safety and that of your employees. We even provide salt and shovels alongside them, making us your one-stop shop for avoiding icy accidents. To place your order, or if you have any questions you might want answering, just give us a call on 0161 765 2010. We’re always here to help!